The Gallia Academy Blue Devils burst onto Bob Lutz Field prior to their Week 9 36-33 victory over the Fighting Tigers in Ironton, Ohio. Last Week: South Point lost to Portsmouth 40-7, in South Point; Gallia Academy defeated Ironton 36-33, in Ironton. Last meeting between the teams: Oct. 27, 2017. Gallia Academy won 47-0, in South Point. Current head-to-head streak: Gallia Academy has won 2 straight. SPHS offense last week: 47 rushing yards, 101 passing yards. GAHS offense last week: 198 rushing yards, 214 passing yards. SPHS offensive leaders last week: N/A. GAHS offensive leaders last week: QB Justin McClelland 18-of-28, 214 yards, 3TDs; RB James Armstrong 6 carries, 75 yards, 1TD; WR Cory Call 7 receptions, 118 yards, 2TDs. SPHS defense last week: N/A. GAHS defense last week: 237 rushing yards, 122 passing yards. 1. The Blue Devils have already secured at least a share of their first Ohio Valley Conference title. Gallia Academy can earn the title outright with a win, or an Ironton loss at Portsmouth. Gallia Academy’s last conference title was an undisputed Southeastern Ohio Athletic League championship in 2012. In all, GAHS won 17 SEOAL football titles, including 11 outright. 2. South Point’s last win over Gallia Academy came on Sept. 13, 1996. The Pointers won that game by a 21-14 final and the teams didn’t play again for 20 years. The last time SPHS visited Gallipolis was Oct. 28, 2016, with the Blue Devils winning 40-24. 3. SPHS has lost 17 consecutive games, committing five turnovers in last week’s setback. The Pointers have lost 24 straight OVC games, with the Pointers’ last conference win coming on Sept. 25, 2015, by a 32-8 count over visiting Fairland. 4. Gallia Academy has a league-best eight-game OVC winning streak. 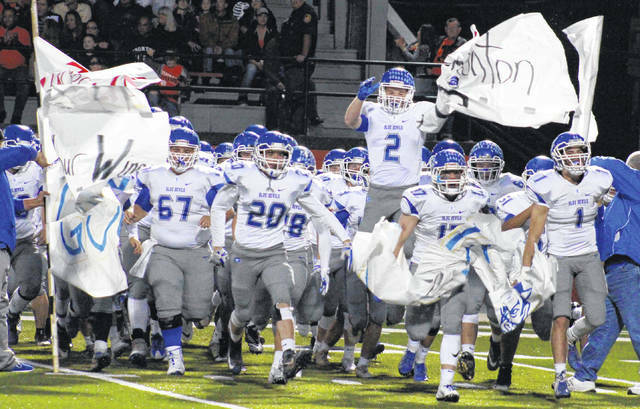 Blue Devils began the streak with last season’s victory over Ironton. Prior to last week, GAHS hadn’t defeated the Fighting Tigers in consecutive years since 1965-66. 5. The Blue Devils are playoff bound for the first time since 2012, and the GAHS has clinched a home game. The Blue Devils enter Week 10 at No. 2 in the Region 15 rankings. St. Clairsville has clinched the No. 1 spot in the region, Indian Valley is currently third, while Bloom-Carroll is in fourth. Last Week: River Valley lost to Athens 55-16, in The Plains; South Gallia defeated Miller 35-7, in Mercerville. Last meeting between the teams: First Meeting. RVHS offense last week: 127 rushing yards, 6 passing yards. SGHS offense last week: 365 rushing yards, 79 passing yards. RVHS offensive leaders last week: QB Jordan Burns 1-of-5, 6 yards; RB Jared Reese 3 carries, 98 yards, 2TDs; WR Trevor Simpson 1 reception, 6 yards. SGHS offensive leaders last week: QB Tristan Saber 4-of-9, 79 yards, 1TD, 1INT; RB Kyle Northup 17 carries, 171 yards, 1TD; WR Jeffrey Sheets 2 receptions, 17 yards. RVHS defense last week: 175 rushing yards, 182 passing yards. SGHS defense last week: 136 rushing yards, 106 passing yards. 1. Not only is this the first meeting between the Rebels and Raiders, it’s South Gallia’s first-ever contest against a Tri-Valley Conference Ohio Division team. Since joining the TVC Ohio, River Valley is 4-0 against the TVC Hocking. 2. The Raiders have lost three consecutive regular season finales, while the Rebels have ended back-to-back regular seasons with a setback. RVHS have ended four seasons with a win since 2000, while South Gallia has won six Week 10 games in that span. 3. Dating back to last season, the Raiders have dropped 12 straight decisions. Meanwhile, South Gallia has won back-to-back games for the first time since 2015. 4. Last week, the Raiders allowed a season-high 55 points, the most scored against RVHS since giving up 77 to Athens in 2014. The Silver and Black found the end zone twice last Friday, their first multi-touchdown game since Week 5. 5. South Gallia has allowed just one touchdown over the last two games, a four-yard pass in the first quarter of last week. The Rebel defense has been flush-or-bust this fall, allowing 8.2 points per game against five teams who enter Week 10 below .500, while surrendering 44.25 points per game against opponents who now have a winning record.